I know it was discussed in the last update thread so I'd thought I'd post some schemes and see which one gets the most approval. If you wwant to post some fo your own, go ahead. If this goes well we could do a T-34 one. -A great one for Sector 318 to match the KT and JP4. http://www.modellbauschmiede.com/Bilder/p4j04.jpg -Not bad but needs to make that dark color a better olive drab and even out the colors more. http://www.modellbauschmiede.com/Bilder/p4hj4.jpg -Probably my favorite of the group. http://membres.lycos.fr/barkmann/galerie/panzer/panzer4h-fd.html -Working on new link for this one. Lookin good, i agree the panzer4 H could use a new skin.. Your last link is faulty btw. Glad someone brought this up, the lime green camo is getting kinda old. I think, after looking at those pics, that the P4 could use a remodel if any dev has the time and initiative. Make it a little flatter and a little more to scale with the rest of the models. Well Im always for some new vehicles skins, I think some other vehicles are in better need of nice cammo schemes. The IV could use some more, but I think that it would be important to work of a historic photo one or a little better documented. Moddlers can take some pretty bug liberties especually cammo schemes. OhioanI think, after looking at those pics, that the P4 could use a remodel if any dev has the time and initiative. Make it a little flatter and a little more to scale with the rest of the models. I completely agree, and in my opinion, the same should go for all DICE models! New models for the panzer 4, the tiger 1, the sherman and the t34! Tanks?I eat 'em for breakfast! The Panzer IV H often didn't have those screens on the sides. 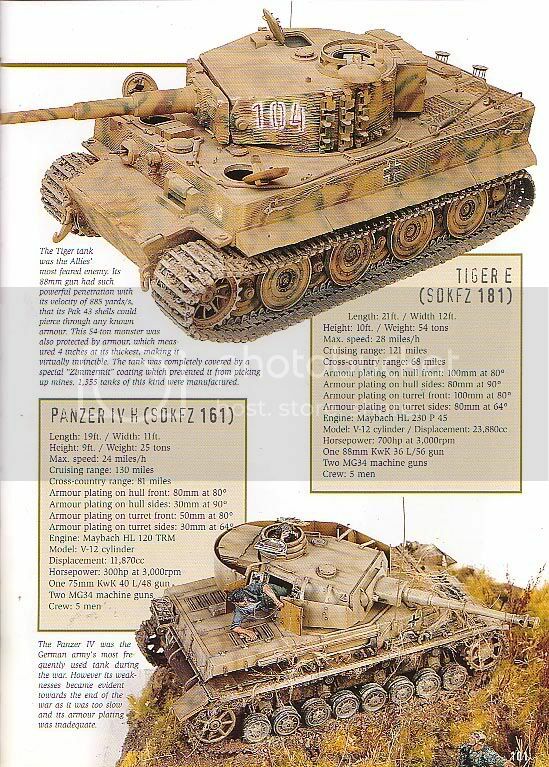 I've scanned some pictures of the Tiger and the Panzer IV H with some info, but I'm not sure if that's readable. Also take a good look at the armor-plating info and you'll see that the Tiger is too weak and the Panzer IV H is too strong in FH in terms of resisting shotinbounds. what do you mean by "shotinbounds"
The H's Schurzen really could be a choice of the crew but most pictures you see it has it applied. Schurzen would often get knocked off thats why you see a big gap in some vehicles schurzen plating. "Panzerkampfwagen IV Ausf H tanks were issued to Panzer Regiments in Panzer Divisions and were used in that role to the end of the war. On June 6th of 1944, majority of Panzerkampfwagen IV tanks present in France were Ausf H." It should also be pointed out that most camo work and painting was done by the crews. So that would allow for a wide range of camo schemes that could work. Also Terminal, he meant incoming shots or its ability to take hits and live through them. And we've all known that the DICE models really arent that good and needed a Remodel. I was trying to get the Sherman remodelled long before Lobo did the skin work along with the PIV and T-34. I have seen quite a few pics of PzIV's with the hull skirts gone but the turret skirts still on and main reason was the skirts got snagged and knocked off, they just hang loose anyways for the same reason. Maybe in hte heat of combat or in a speedy withdrawl to avoid being cut off by advancing Soviet troops no one wanted to stop the tank and jump out and put them back on.